A World War Two bomb containing 290lb (131kg) of "high explosives" has been found in Portsmouth harbour. The ordnance was discovered by a dredger in the water at about 03:00 GMT, the Royal Navy said. Specialist divers at the scene said the bomb posed a "very serious threat". It was towed out to sea and detonated. All ferries were stopped and trains between Portsmouth and Southsea station and Portsmouth Harbour were suspended, but have since started running again. There were also extensive road closures in the area, affecting access to Gunwharf Quays. 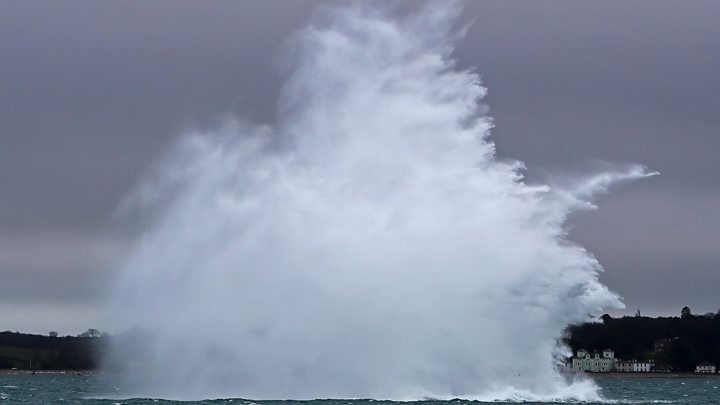 The Royal Navy said the device, believed to be a German SC250 that weighs 500lb (227kg), was removed from the harbour before being "safely" blown up in the sea off the Isle of Wight. Lt Mike St Pierre, the officer leading the bomb disposal team, had said: "Despite being old, these devices can pose a very serious threat." Hampshire Constabulary said it had "activated a pre-arranged multi-agency plan" with Ministry of Defence Police, the Royal Navy, Portsmouth City Council and other organisations. "Our priority is to ensure public safety and minimise community disruption while the ordnance is detonated by the Royal Navy Explosive Ordnance Disposal," the force said. It advised residents to stay in their homes, open the windows and move away from the outer walls. Dredging is being carried out to deepen and widen a four-mile (7km) channel to allow the the navy's new 65,000-tonne aircraft carriers to dock. Several devices have been found in the harbour since work started in September. The most recent discovery was a British-made Armstrong Whitworth device found in the early hours of Friday morning, the Royal Navy has said.